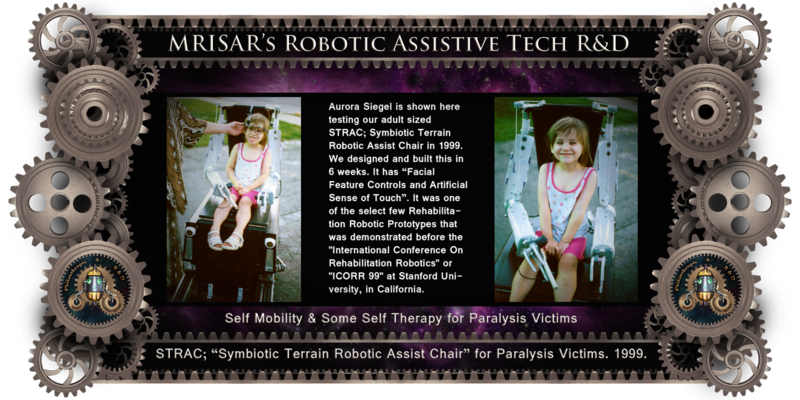 MRISAR's Rehabilitation Robotics; STRAC, Symbiotic Terrain Robotic Assist Chair. For Paralysis Victims. Designed and built in 6 weeks in 1999. It is a Facial Featured Controlled Robotic Device. It was one of the select few Rehabilitation Robotic Prototypes that were demonstrated before the "International Conference On Rehabilitation Robotics" "(ICORR)" at Stanford University, in California. 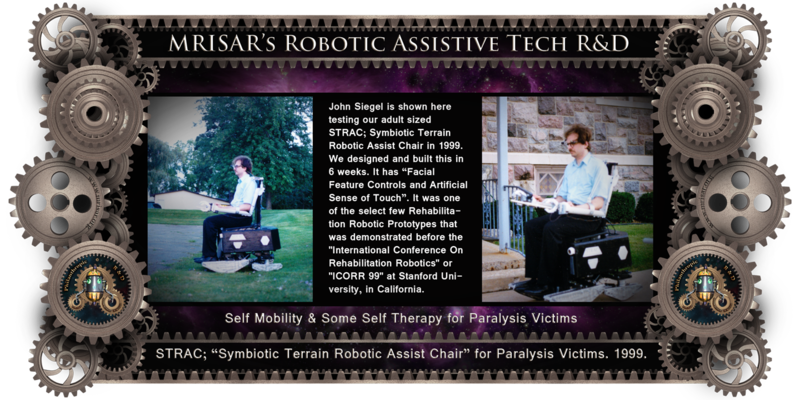 STRAC, stands for Symbiotic Terrain Robotic Assist Chair. Although STRAC, features some of its predecessors functions like artificial touch, artificial instinct and facial feature controlled actions, its improvements include some Self-therapy. It may also be the most powerful wheelchair ever built. Its base is an all-terrain design that is strong enough to pull a car. 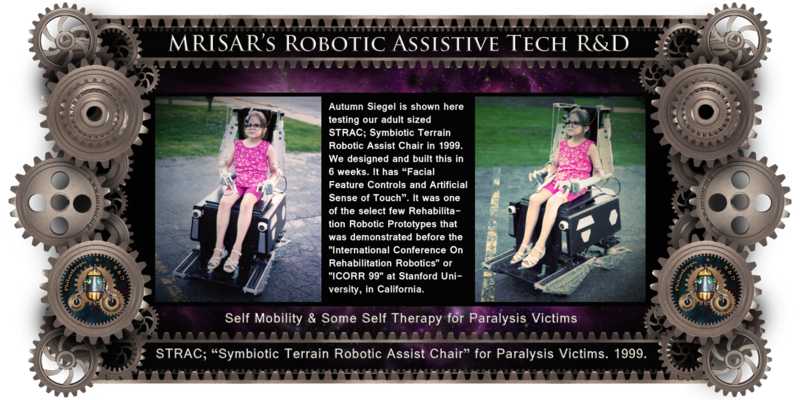 STRAC, is capable of climbing hills, curbs, and can tilt itself to compensate for the slant of the ground, raise and lower the patient, speak to the user to inform about its current status, sense the patient’s facial movements and react to those movements by creating appropriate actions in its autonomous base and two exoskeleton arms and metal fingers. It also features an automatic navigation system that can “see” in light or dark to assist in avoiding obstacles. The chair sees using short bursts of ultrasonic sound bounced off objects to judge distance. STRAC also has an improved pen attachment that allows better reach and more dexterity when drawing and writing. The chair operates on 24 Volts. STRAC uses 3 or 4 facial feature movements to utilize 40 different basic functions which is expandable to hundreds, while relating its status through a visual indicator console. In practical terms this design is easy to control and allows multitasking. This is an improved version of the technology we created for our first Facial Feature Controlled Robotic Wheelchair where we could easily control a five range of motion robotic arm on a robotic wheelchair base entirely through the use of moving their eyebrows and nostrils alone. This enables the user to maneuver around a room in any direction, pick up and move objects, and print or draw on a vertical surface. 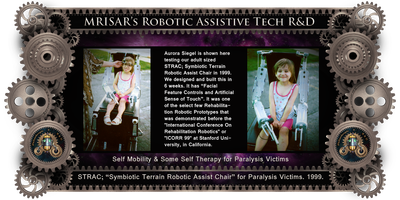 STRAC’s, wheels are unique triangular multi wheel devices, designed to climb uneven surfaces. The idea behind STRAC, is to give paralysis victims hands on interaction with their environment and the durability to challenge the outside terrain. STRAC, also sends information about its status to the patient by beaming it into the top of the lens of the eye. There is no need to look down at a control panel which had been a short coming of the original chair. STRAC’s console is always a glance away and held in permanent focus to the patient’s eye. 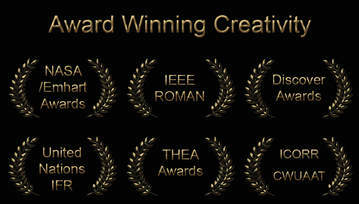 STRAC II, was designed in 1999, however its completion date is dependent upon available funding. It is a streamlined, light weight version of STRAC. STRAC II is forty percent lighter and has increased dexterity and modes of operation. The ultimate design will literally form to the patient’s body, has self-therapy applications and is light enough to easily handle.